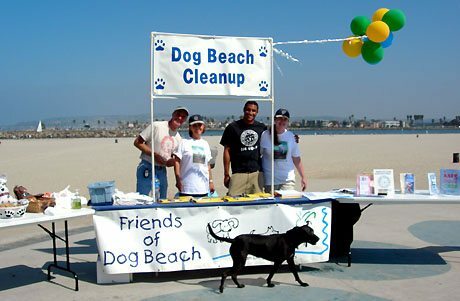 Dog Beach Dog Wash created "Friends of Dog Beach" in 1995 as a group of volunteers dedicated to preserving and enhancing Dog Beach and improving the water quality of the San Diego River and the Pacific Ocean for dogs, people, birds, and aquatic & marine wildlife. Meandering west along Voltaire Street I begin to notice of how truly “walkable” this area of our community is. The towering trees provide much needed fresh air and shade; the sidewalks clean and lit at night by brightly painted light poles; there are virtually no traces of doggie doo anywhere; many shops have their doors open with business in full swing. From all appearances, Voltaire Street is alive and well in this current economy. As I approach Mindy Pellissier’s shop, Dog Beach Dog Wash, at 4933 Voltaire, I notice large coolers of fresh water perched atop custom made semi-circular wooden benches out front. They hover directly above clean dog water bowls that rest on green outdoor turf. It’s only a matter of moments before the first of many passing pooches stops for a refreshing drink of cool water. One passer-by deposits fido’s last bag o’ doo into the covered stainless steel trash can and selects a new doggy doo bag provided at no cost to the community by Mindy’s shop. While waiting for Mindy out in front of her shop, it’s easy to confirm what those that know her have told me about her…. she has done a lot in and for the OB community in the years she’s lived here, so much in fact that it boggles my mind. Simply sitting outside her business, watching all the customers (both human and K9) come and go from her shop is encouraging to our local economy. It wouldn’t be until speaking with her over the next two hours that I would discover just how much she’s done to enhance our charming community and bring a better quality of life to many who call OB home and visitors alike. Entering the shop, I am greeted by smiling, happy people washing their dogs in raised, sparkling clean porcelain tubs (the first of their kind in California). The dogs are calm, enjoying themselves as much as a bathing dog can, and their owners are busy scrubbing and rinsing wet fur with soapy hands in aprons provided by the shop. The smell of wet dog fur wafts through the air and for a dog lover like me, it’s a delightful smell. Staff is attentive, friendly, and eager to aid the customers in any way they can. Conversations easily flow between dog owners and everyone is generally having a good time. Perhaps the wet pooches would tell another story, but all in all they are doing well and anticipating their treat at the end of bath time. Mindy is in the rear of the shop conversing with a few members of her staff when I introduce myself. She is petite in stature yet a quiet powerhouse of leadership from within. She begins by giving me a thorough tour of her entire facility, showing me the front room where the tubs are located, the dog training room on the east side of the shop, and the back offices where supplies are maintained, paperwork neatly kept, offices and tool storage. It is all highly organized and well thought out for ease of access. We find a comfortable seat out back and settle in for an hour interview. Our conversation easily flows into two hours and I am honored by her gracious gift of time to speak with me about her involvements in OB. Mindy is co-owner of Dog Beach Dog Wash with Jane Donley – which opened its doors 17 years ago. As I inquired as to what brought her to OB, she openly speaks of her 40th birthday, her mid-life crisis, and need for life change arriving in succession. And this community, as a whole, is better off because of it. Three years after moving to OB, she and Donley opened Dog Beach Dog Wash where it still operates successfully today on Voltaire near Cable. But operating the most successful dog wash in the country isn’t what pleases her. It’s what she’s been able to do for the community she calls home through her business that brings her to life. Mindy served on the OB Planning Board for eight years. First to join San Diego River Coalition. Proposed scientific study that resulted in Dog Beach staying open when pollution upriver threatened it with closure. If a person’s worth was measured by what they do for others, Mindy is the richest individual I have met in a long, long while. Her longstanding endurance from her preferred behind-the-scenes position has enhanced our community tremendously. Her quiet, guiding vision born out of crisis 20 years ago has enhanced this community again and again. Take a walk along Voltaire Street between Cable and Bacon on any given day and notice what’s working in OB that Mindy manifested….shade yourself under any of the tall trees, rest awhile on any number of custom benches, stroll peacefully with others who are simply enjoying the good life we share in OB; the life Mindy’s efforts and actions have enhanced for all of us, human and K9, to enjoy each day. Would you like to get involved in what has worked well in OB for nearly 20 years and keep this positive force moving forward? Mindy is the first to acknowledge all who have volunteered over the years with her on these community enhancements and knows her organizational efforts would be in vein without all who step up and pitch in. Stop by her shop anytime and pick up the monthly schedule of events. You’ll find Mindy there six days a week, either buried under mountains of well organized paperwork or up to her elbows in doggy shampoo bubbles. I have to say that over the years I’ve known Mindy, she never struck me as petite in stature. Whether it was giving me back as good as I could dish out on the Planning Board, beautifying Voltaire (including the painted light poles), advocating for more street lights in OB as a matter of public safety, promoting the businesses of women in Ocean Beach, mediating the conflict between the travelers (yes the same) and the established business community (yes the same again), enforcing the OB Precise Plan, effecting new policies (undergrounding of utilities) under the direction of the plan or rescuing dogs from Katrina, she always appeared as big as her heart. What your story didn’t mention was the amount of crap she’s had to take from the same mob of belittling local-yokels that’s still tearing down what’s right and good. Today we need, more than ever, a bunch of Mindy Pellissiers to stand up in the public arena. My hope is that this new crew of OBactivists will learn from her experiences and gain from the strength of this long time progressive OBcean. It would serve our community well if we all did. Oh, I forgot to mention that she was instrumental in getting the city to adopt a policy regarding cell phone transmission sites, in the OB Entryway project and in the OB Planning Board’s policy vis a vis billboards.- d.
Thank you for that refreshing story Sunshine. Mindy….just wanted to say thanks for all you did and do! Also wanted to mention that she speared headed the OB Community Plan and worked on this project for years. It’s always a joy to go into your dog wash that is clean, bright and cheery with a friendly staff! Many more years of success to you! Nice article… Mindy is great. sunshine great piece! For those of us who don’t know about all the work Mindy has done for OB over the years, it is an education in true community activism….making the area more walkable has benefitted that whole section of OB and it is clear Mindy’s contributions go far beyond that. Thanks Sunshine for writing on Mindy Pellissier! Her improvements to our community including work on the OB Planning Board deserves a standing ovation! What Mindy has done for the community is AMAZING. There is a special place for you in heaven Mindy!!! Thank you so very very much for making OB Dog Beach and Dusty Rhodes what they are–great off-leash areas for canine companions to romp and play! Your hard work has put OB on the map for being a top destination for dog lovers!